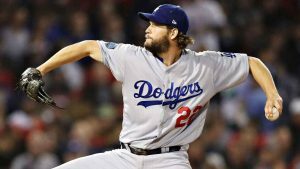 Clayton Kershaw and the Dodgers have agreed on a three-year extension that will keep the greatest pitcher of his generation from venturing into the free-agent market. The Dodgers announced the extension Friday. The deal will pay Kershaw $93 million, a source told ESPN, and includes incentives based on workload and performance. Kershaw reportedly will receive $4 million annually in bonuses based on starts, in four $1 million increments, as well as other incentives. The extension replaces the two years and $65 million remaining on the seven-year, $215 million extension Kershaw signed in January 2014. “Honestly, I wanted to stay here,” Kershaw said. “Financial, everything aside, it was more valuable to me to stay here. I’m glad we got that done. I talked a lot with Ellen [his wife]. My kiddos love it here, Ellen loves it here, I love it here. I love the team here. There’s not many opportunities that meet all the criteria that Ellen and I would be looking for. Kershaw, 30, said staying with the Dodgers also allows him an opportunity to answer some of his critics, who have said he isn’t as dominant as he used to be. His final start was the Dodgers’ last game of the 2018 season, when he gave up four runs in seven innings and was outdueled by David Price of the Red Sox in Game 5 of the World Series. Kershaw’s fastball averaged only 90 mph on that Sunday night, a snapshot of the decline brought on by an exorbitant workload and three consecutive seasons with back injuries.